Elisabeth Sage ’19 knows a thing or two about wrestlers and their eating habits. Professor Melinda Green works with Elisabeth Sage ’19. Now she’s learning even more about wrestlers in her research project for the Cornell Department of Psychology. 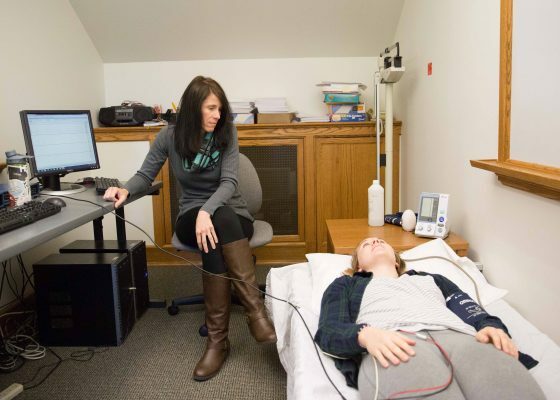 The junior from Denver, Iowa, is in her second year of working on a project that was inspired by Professor of Psychology Melinda Green’s long-running research about cardiac risks associated with eating disorders. “There are not many people in the U.S. actively looking at the relationship between cardiac markers and disordered eating,” Green said. While Green’s research focuses on women, Sage took her own approach. She’s looking at the risks of cardiac death for men, especially male collegiate athletes, in weight-pressured sports (wrestling) who participate in maladaptive-eating behaviors such as fasting, water reduction, sauna use, cutting down on proteins, or cutting out electrolytes. Sage finished working with her final few test subjects at the end of the school year, and now she’s analyzing the data. Sage’s 61 subjects were placed into one of three categories–NCAA athletes in weight-pressured sports (wrestlers), NCAA athletes in non-weight-pressured sports, and non-athletes. Each person participated in a 45-minute session in which Sage took their heart rate, cardiac functions, blood pressure, and body mass index. Subjects also filled out a survey. “I’m specifically looking at a couple of cardiac factors, including decreased R wave amplitude (decreased force of the contraction of the ventricles of the heart), which has been shown in eating disorder patients, and prolonged QT intervals, which looks at if it’s taking longer for the heart to go through its whole circuit,” Sage said. Sage said the results could also help enforce healthy attitudes in wrestlers because cardiac markers don’t lie. Professor Melinda Green said Sage has been working ahead throughout her career at Cornell. In fact, she started this Senior Honors project the fall of her sophomore year. “She has always been about a year ahead of her trajectory, taking many classes early,” Green said. Sage hopes to become published with the results of her research. “It’s exciting to know that if I do discover significant findings, it’s going to be groundbreaking,” Sage said.